Tarragon traces its historic roots back hundreds of years before Christ. 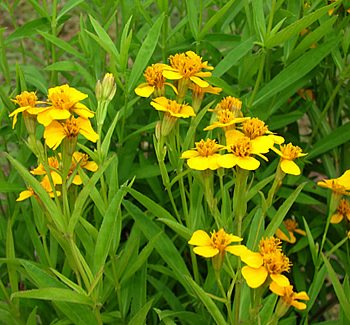 Its use was recorded by Greeks about 500 BC; tarragon was among the so-called “simples”, one-remedy herbs, used by Hippocrates. European gardeners knew tarragon in the Middle Ages, but it wasn’t until the end of those dark times that it leaped the English Channel. It entered England during the Tudor reign probably as a preferred gift for the royal herb garden from the Continental monarch. 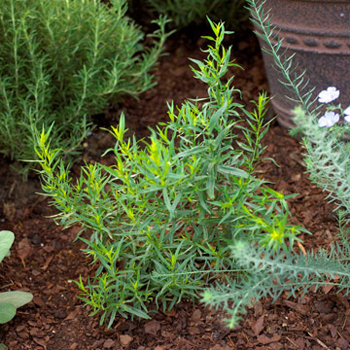 For many years, tarragon was relatively unknown outside the royal garden. It must eventually have made good its escape, because it arrived on America’s post-Revolutionary shores in the first few years of the 19th century. The common name probably is a corruption of the French esdragon, derived from the plant’s Latin specific name dracunculus, a little dragon; p possibly so named because of its brown coiled roots resemblance to a cluster of small, gnarled serpents.